Even more so when the Cleveland Indians are still in the running. So when the matchup was announced for the Cleveland Indians to battle the Houston Astros, my interest was piqued. You see, Houston is only about a 2 hour drive and game day just happened to lie inline with our days off. Since we would be making the two hour drive, we decided to enhance the trip with a few days in Galveston. We had explored Galveston with my parents earlier this year and had said we would like to go back and do some more exploring during our stay in Texas. Now was our chance. We headed toward the big city early on Friday morning. We planned to make a quick stop at La-Z-Boy Furniture and of course a quick lunch at Torchy’s Tacos. Our La-Z-Boy Furniture stop was in search of some multi-functional chairs. When you live in a small space, you always try to maximize the uses for a single item. A coffee table that can be raised to desk height or a sink cover that can double as a cutting board to name a few. To be honest, we rarely if ever use those items for both purposes, but you get the idea of what we try to accomplish. We are seriously considering, adding some flip-up desks in the back of our RV and are in search of chairs that can double as recliners to relax in and then turned around to be used as practical office chairs. Might not be too hard to find if our top priority wasn’t for them also to be super comfy and fit in a small space. We had eyed up some options at La-Z-Boy on several web searches and wanted to “test sit” them in person. After practicing our best reclining positions, we left with a chair in mind that we were going to debate about over the weekend and stop back before heading back to Port Lavaca on Sunday. Our quick visit to La-Z-Boy wasn’t so “quick” but we still had to grab a lunch at Torchy’s which ended up being both quick and tasty. Now it was on to Minute Maid Park. We would usually have allowed more time prior to first pitch, but let’s just say we weren’t quite to our seats when Houston Ace Justin Verlander threw his first pitch to Indians Shortstop Francisco Lindor. Oh well, there would be hundreds of other pitches for us to watch. After a few trips around the traffic-packed blocks near the stadium, we scored big with a free parking spot with Russ showing off his rusty, but still remarkably-good parallel parking skills. We briskly walked to the stadium and huffed up to the nose-bleed seats. While the result of the game were not our preference, getting the opportunity to catch my favorite team in a nearby city was well worth the trip. On our previous trip to Minute Maid Park where we also found a sweet parking spot and watched the Indians lose, we felt like we should eat at the same restaurant too. Just as we did the first time, we would highly recommend Batanga if ever in the Houston downtown area. It is a Latin-American tapas restaurant with a menu filled with tasty small-plates, many of which has the little symbol that makes the corners of Russ’ mouth curl in joy, a little gluten-free symbol! 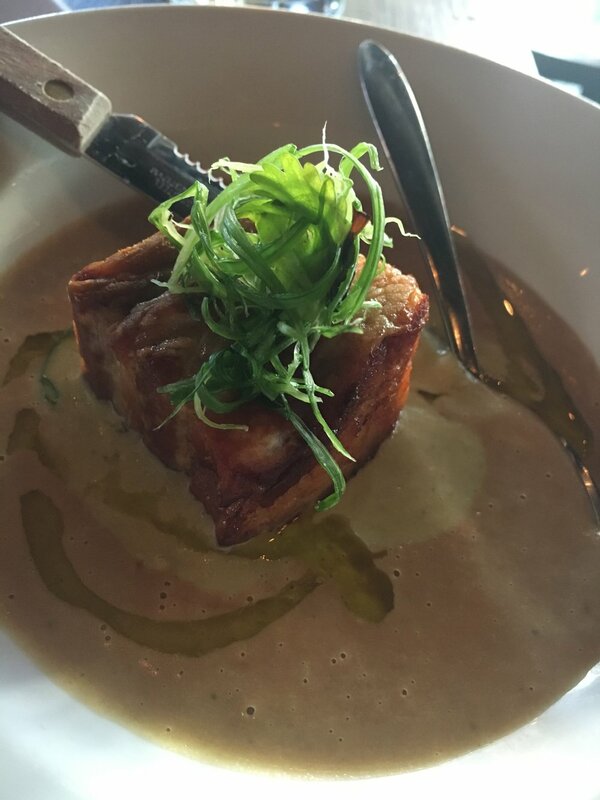 While we did try some new dishes, we couldn’t help getting another taste of some of the ones we enjoyed so much last time. Since we were on a roll with repeating things we did the last time we were in Houston, we stopped at Boomtown Coffee for a java nightcap. More so to avoid rush-hour traffic, but equally as much to enjoy a carefully-crafted espresso drink to drown the sorrow of the Indians loss. We had booked an Airbnb for Galveston for two nights, so we made the ~45 minute drive toward the coast. We’ve haven’t used Airbnb a ton, but all of our experiences thus far have been great. We typically look for places that have a kitchen to save on expensive travel meals and this time the laundry was a bonus money saver! 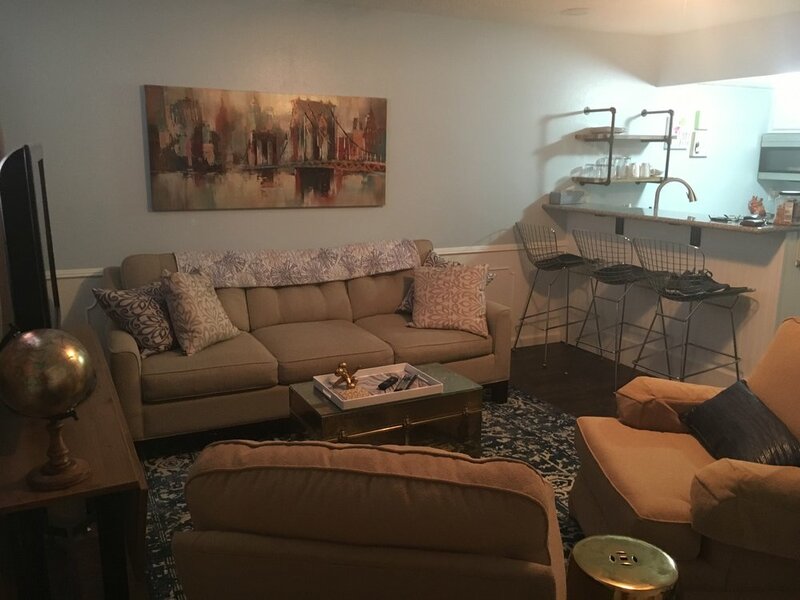 Speaking of money savers, if you don’t have an Airbnb account yet, we would love to offer you our referral link (www.airbnb.com/c/betsyg985) because friends don’t let friends miss a discount, plus we get some travel credits too which we promise you we will enjoy in your honor! You will save 4 Hamiltons once you book your first trip, that’s $40 you can spend on coffee or ice cream instead! If you book a trip you love, let us know about it as nothing beats a great getaway. We had an easy check-in to the one bedroom second-floor condo and retired for the evening. It was a clean and well-decorated condo with separate bedroom. Definitely would work for 4 adults easy! We looked like a fumbling couple of old folks trying to figure out how to use the Roku/Hulu provided at the Airbnb rental. We like to think of ourselves as somewhat tech-savvy, but TV-streaming options are out of our ballpark. Our wifi connection is usually sketchy, so it isn’t something we need to have much knowledge about. Maybe someone can explain what we are missing out on and come play personal geek squad for us! After a great night’s sleep, especially for it not being on our own new PURPLE mattress, we started off the day by making breakfast in the room. The beauty of an Airbnb - many have kitchens which allows us to save money on these getaways. With fueled up tummies we just needed to check our oil level or should I say the caffeine level with a trip to a local coffee shop. Typically our mantra is “But first, coffee” but this particular morning it was “But first, ocean” with a walk along the Galveston Seawall. The water views were a beautiful start to a day of exploring. But this didn’t replace our need for coffee it just meant “But second, coffee!” Off to MOD Coffeehouse we went for a relaxing hour to chat over cold brew. As we arrived in Galveston, we had noticed signs for a library book sale which happened to be going on during our visit. So our next stop was the Rosenberg Library, which not only was a library, but a cool old building to admire. The book sale was huge and we spent quite a while pursuing and left with a big bag of books for the price of only one or two books. Our cabinet of books was getting pretty sparse so this book sale did the trick to fill it back up. When reading about “cheap” things to do in Galveston, often on top of that list is a trip on the ferry to Bolivar Peninsula. It is a fully-operational ferry that provides service from Galveston to the “The Peninsula” as the locals call it. So if the ferry ride tops many lists of things to do in the Galveston area, you would expect the destination it takes you to to be grand. Quite the contrary and not in a bad way. Bolivar Peninsula boasts 27 miles of sandy beaches and a place where you will find no big chain stores. Kind of a nice escape, especially from the hustle and bustle of Houston. It reminded us of the remote parts of the Outer Banks only a ferry ride away from the conveniences of Galveston. So if the destination is not the draw, what makes the ferry ride so popular? The answer would be DOLPHINS! We saw more dolphins in the 20 minute ferry ride than we have ever seen in one place. They were leaping in the air and performing underwater acrobatics in nearly every direction you would look. We saw hundreds of them on both the ride to and from Bolivar Peninsula. As we drove off the ferry, we were tempted to make a repeat trip. The best FREE dolphin cruise in Galveston. Once we were back in downtown Galveston, we did our best to secure a convenient, yet free parking spot. We were successful and browsed thru a few stores that caught my eye, Kitchen Chick and Betsy by Design! We met the owner, Betsy, and her stationary and custom print and design boutique was definitely my kind of place. Maybe there is such a thing as a name defining skills and abilities. Funny in that I used to have an invitation printing business too. It was so cool to meet you Betsy! There were two cruise ships in town with departures scheduled right around 4 PM. Waterviews and boats are kind of our thing, so we headed off to find the perfect boat-watching spot. Walking down the Strand thru the Historic District, we popped in La King’s Confectionary for a cold drink. La King’s features a working 1920’s soda fountain, where they serve up ice cream floats and sodas. Somehow passing up the ice cream portion, we ordered up two Club Sodas with lime for refreshment while watching the big ships and cruise ships enter and exit the harbor. We continued past Pier 21 and found a nearly perfect and shady bench to enjoy the comings and goings of the ships. As you can see, it doesn’t take much to entertain the two of us! We headed back to our Airbnb, caught up on some of the new fall TV shows (we kinda figured out Roku/Hulu) and enjoyed a quick and easy dinner. Just as we had started our morning, we finished our evening with a walk on the Seawall. Since we were on the Gulf of Mexico and had yet to have our toes in the sand for the day, we walked along the sandy beach for a mile or so before walking back on the raised Seawall to avoid from being attacked by the crabs which were out in full force as dusk approached! Our day of exploration had been wonderful, so we capped it off with ice cream from Marble Slab Creamery which may have attributed to extra sweet dreams that night. While we try to pack food for our getaways as a budget minder, we also enjoy getting to try local restaurants so Sunday brunch at the Mosquito Cafe it was. Huevos Rancheros for me and Crustless Quiche for my wheatless partner-in-crime. Thanks to the Find Me Gluten Free app and the sign we saw while waiting in line to place our breakfast order, we ended up across the street at Patty Cakes Bakery for a sweet treat to go, two delicious coconut macaroons. Along with lucking out in the book sale, we also happened to be in town for the Galveston’s Own Farmers Market. We stopped, but weren’t overly impressed by the selection. However, they are celebrating their 6th anniversary and are still bringing local foods and fresh produce to those in the Galveston area which is exactly the purpose of a farmers market. A true farmers market is nothing without quality people who offer their goods and faithful customers who understand that local food economies are more than buying from the grocery store or ordering online. Regardless of size, it is important to remember that the vendors that are there work hard — the bakers knead bread every week, the ranchers raise & butcher animals every week, the farmers plant crops and work rain or shine every week. Show your love because they show their love each week. Just a little farmers market rant from us ex-farmers market vendors. While we had been fueled up from breakfast, we still hadn’t gotten caffeinated for the day. Tempted to just head back to the coffee shop we enjoyed yesterday, we wanted to try something different and support another small business. This decision brought us to a unique coffee shop built into a residential housing community. We think that is such a cool concept, when homes are built with things all within walking distance. It’s like bringing the downtown life to a suburban area. Sugar Bean Coffee & Cream was brewing Texas Pecan cold-brew which was enjoyed at a shady table lakeside outside of the coffee shop. Perfect served alongside of the coconut macaroons we bought earlier at Patty Cakes Bakery in downtown Galveston. We reflected on the fun weekend we had in the Houston/Galveston area while watching turtles pop up here and there and large fish jump in the middle of the lake. We got one last sneak at the Gulf of Mexico, before heading back toward Port Lavaca. We had told our salesman at La-Z-Boy we would be back on Sunday with our decision on the chairs we had looked at at the beginning of the weekend. We had decided to sit and measure one more time before deciding. After some reclining, we decided to go for it. We bought them and scheduled to have them delivered in about a week. We thought that maybe the color was a little “too yellow” for the rest of our decor. So, we did take a fabric sample to bring back to the RV to check colors with a promise of a refund if we decided the color was a no-go. With one decision made for the day, the next choice was between Torchy’s Taco and Bellagreen for lunch before driving back to “Charlie” in Port Lavaca. If you know are history with being near a Torchy’s, I’m sure you would predict that’s where we ended up, but our curiosity took us to Bellagreen, a fast-casual, certified-green restaurant we had yet to frequent. Highly recommend for all, but definitely for those looking for gluten free, dairy free, vegan or paleo options. Any place with a dedicated fryer for their french fries has a special place in Russ’ heart. With a coupon on the Bellagreen app, we also left with a free dessert which just happened to be some delicious gluten free carrot cake adorned with decorative chocolate and mango and raspberry puree. Now that we had explored and sampled our way across the area, it was time to head home to make sure we could still zip up our pants in our closet. We still did have a few days in case we needed to go “fat clothes” shopping. We may have over-indulged, but amazingly our pants still fit. While the RV-life often throws wrenches in the road, weekends like this make us incredibly thankful for our life and the opportunity to see things we wouldn’t have usually been able to take time to enjoy. P.S. - So about those La-Z-Boys, the color looked great. Spot on matchy-match with the rest of our decor. Perfect, right?? You know the phrase, measure twice, cut once . . . that should apply to ordering furniture too. The chairs looked the right size in the store, but would have been way too big to try to swivel between the TV view to the desk view. A quick call to cancel the order and we are back in the research phase.